antipatterns are antithetical to a diverse and growing indieweb, often times the opposite, or at best a distraction from indieweb principles and building-blocks, yet persistently repeated despite their tendency to waste time and cause failures. Inbox - got an antipattern you think needs documenting? add it here with a brief one sentence summary and maybe someone will start a page on it. plumbing-first-antipattern - when web developers design something from protocols/formats up (including naming, e.g. "RSS-based Twitter"), rather than the UX/design down. It is a common subset of the solution-in-search-of-a-problem-antipattern. field-of-pipe-dreams-antipattern - perhaps a special case of the plumbing-first-antipattern, the "field of pipe dreams" antipattern is a phrasal portmanteau (phrasemanteau?) that references the movie "Field of Dreams" and the common expression "Pipe dream" to encapsulate the hope or expression that "If you [only] build the plumbing (pipes), they (the developers, users, etc.) will come", a derivative of a quote from the movie, implying its unlikelihood by referencing "pipe dream", something that "will not likely work; a near impossibility", due to its focus on pipes/"plumbing". Ember.js and possibly other modern JS frameworks have a URL router, so that you can have both client-side rendering and real permalinks. preload-antipattern - websites that show a "Loading..." screen before actually showing you content, like some sort of reminiscence of Flash sites of yore. cargo-cult-antipattern - the tendency of many (most?) web developers to code by rote/tradition/fashion/trends rather than actually have a rational understanding of the technologies they use and how to analyze tradeoffs therein, sometimes revealed by purely emotional responses to having their tradition/fashion/habits questioned. Reasoning or justifying something by saying "at some point" does not lead to good (well-informed / accurate) conclusions. Many a spec/standard/protocol/format has been overdesigned or made prematurely complex due to "at some point" reasoning - typically followed by a theoretical requirement framed as "someone will need to ..." or "we'll have to ...". It's flawed methodology that gets in your way if you're actually trying to build things that work today, can be incrementally improved, and sustainably grown. Alternative: resist the temptation to design for "at some point", and instead design for the very next thing that is annoying you the most (itching) about your own site. And then iterate. Only by doing so can you actually get to that "at some point" future, and when you get there, since you proceeded incrementally, there's a much better chance that you've arrived there with a minimum of wasted effort chasing down theoreticals that turned out to not be probable, or not matter. It's been noted that for some sites and silos, PESOS appears to be easier to implement than POSSE, with the excuse of: "do the easy thing now and fix it later". This is a trap in practice because the "fix it later" task starves due to distraction by too many "easy thing now" items which keep getting more attention due to their apparent easiness/urgency. It's empty/hollow/unreliable reasoning/planning. In a community context (e.g. #indiewebcamp) it is worth investing some amount time in others' "urgent" items (especially if you can help quickly), with the expectation that later when you have something *important* to you and ask about it - the likelihood of reciprocation is greater. Also contributing to a community culture of helpfulness scales well with the size of the community - as more and more people help each other quickly more and more, each of us gets our important things done faster. The "easy urgent vs harder important" antipattern is somewhat related to the above "at some point" antipattern but is not the same. The "at some point" antipattern is about things that are harder and appear to *theoretically* be important but are actually unimportant in practice. For any content you care about it, don't put the primary copy in a database. Databases are all a pain to maintain (i.e. highly human-time inefficient - see also DBA tax), and more fragile than the file system. A DBA tax includes the (often regular) hassles of: setting up a database, setting up/doing tables, setting up username/login that is database specific, altering tables, dealing with username/login that is database specific, exporting, importing, special backups. All extra crap (thus tax) compared to "just" using the file system. All databases have a DBA tax. Common content management systems (e.g. 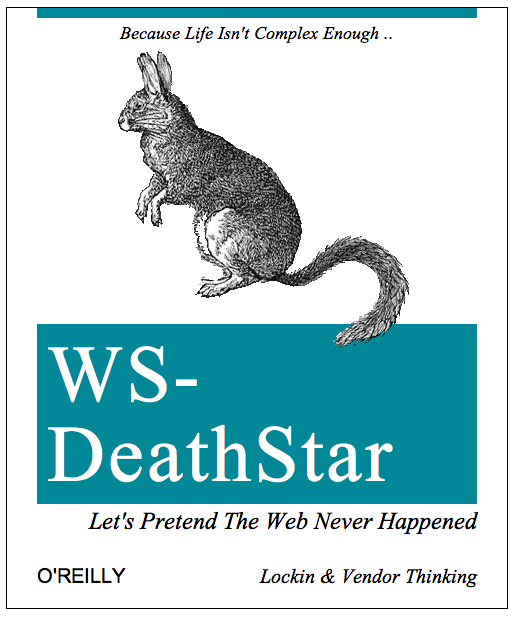 WordPress, Drupal, MediaWiki etc.) use databases for primary storage of content, and thus saddle their users with a continuous DBA tax just to maintain their site. Experience and evidence shows DBA tax exists as well. People lose things (and have them corrupted) in databases all the time, far more often than in file systems. This is because databases always require extra "magic" for backups etc. E.g. search the web for people complaining about having to backup their WordPress databases before upgrading their WordPress install. As well as alternatives to use instead and an FAQ. Designing explicitly for silos or the enterprise (not Star Trek) is an anti-pattern. "what pisses me of even more is that all the silo ppl asking for it... will not end up using it. like we saw with activitystreams as well. but they'll just end up complicating stuff. it's telling that the webfinger spec has hypothetical examples of "possibilities" "
"sandeepshetty - your analysis is correct. thus, just ignore the silo people as they won't actually ship / interoperate anything anyway. they might as well just be making a bunch of noise on a mailing list. oh wait." "enterprise is fairly ignorable. once the open web adopts something the enterprise eventually begrudgingly adopts it too. no need to actually include enterprise in any early (any at all?) standards discussions. though if you can honeypot them into their own standards committees, it can help reduce the amount of noise/distraction they cause elsewhere. e.g. 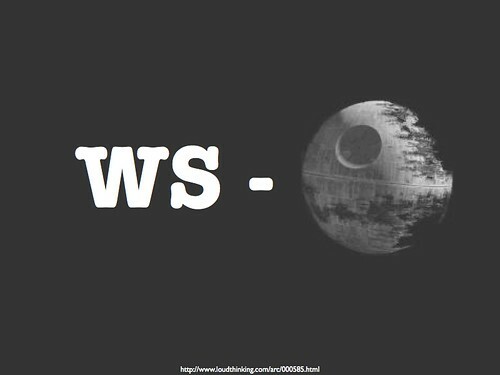 WS-Deathstar"
"Web Services" (or WS and the suite of WS-* specs like WSDL) were a prime example of design by and for enterprise. IndieWeb community member Amy Guy summarizing why selfdogfooding is the positive and self-empowered answer to "mass adoption" question/framing/assumption. The methodology of attempting to design directly for "mass adoption" or "mainstream adoption" is an antipattern and will likely be an obstacle to actually designing something useful, especially for yourself (vis-a-vis self-dogfooding). AKA the "design for everyone" anti-pattern. The appeal of design for "mass adoption" (and/or having that mindset) is the illusion that it is actually possible to do so successfully and quickly get everyone to use whatever it is you're building. Designing for "mass adoption" is one of the traps that many past federated/social web efforts fell into. It's a form of distraction: instead of designing/building what's immediately useful to you, the creator, you end up ratholing on what "everyone" or "the average person" seemingly wants, which is purely hypothetical, because you don't actually know what everyone or the average person wants - you're just making guesses and assumptions. The problem with designing for something so theoretical is that you will never know if you're on the right track or not. Design for yourself and get immediate rapid feedback which you can use to quickly iterate, try experiments, change things around, continuously incrementally improve things etc. Designing for mass adoption is one reason why silo user experiences in general get worse over time. Which is also an opportunity for you, as a creator and contributor to the indieweb, to not just match but do better than the silos with the user experience on your own site. It can also be a vulnerability, e.g. if "this will only be useful once everyone adopts it", you're likely building something that is vulnerable to either never being useful, or becoming useless when adoption fades. Invisible metadata is the general antipattern of storing information that is user-relevant in places users won't see (i.e. users aren't expected to "View Source" on every page). spam - often advertising a silo site as a whole rather than having to do with the specific page. The use case for invisible metadata is to make data available to computers but not visible to people. For example, User:Snarfed.org and others would like to make their h-card's photo available to webmention consumers, so that e.g. they appear in comments-presentation, but not visible on their home pages. See also h-card#Issues. The monoculture antipattern is best described as, if only everyone would install and run this one open source project then we will be good. BuddyCloud "is an open source, distributed social network"
No one particular project should be considered a "distributed social network"
Diaspora to some degree emphasized interop with other Diaspora instances, though it did support several open standards, and thus made progress towards open interop rather than single-project-interop. Tent.io has been pitched as a single project distributed social network solution. Encourage monoculture projects to support indieweb building-blocks and become indieweb friendly. Encourage participants in monoculture projects to join IRC and signup on the Guest List to attend the next IndieWebCamp. By engaging these projects productively, perhaps we can help improve them and their cross-project interop. @shujaxhaider: I want an app for each website I visit. And I want all of them to have loud videos that play automatically. - sarcastic Twitter thread listing numerous anti-patterns, including loud autoplay videos, apps for content, and others. "This blog post touches on one of the key causes of bad software & missed schedules. Premature abstractions, unnecessary extensibility and focus on challenging edge cases has destroyed more projects than I can count. This page was last edited on 18 February 2019, at 19:15.